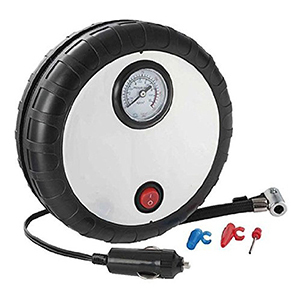 Never worry about being caught out by underinflated tyres again with this tyre inflator! When you’re going on a long journey it can be really worrying to think that there could be a problem with your car when you’re far away from home and there are no nearby service stations. Even when you’re not taking a trip it’s easy to forget about checking your tyres regularly – until you suddenly realise that they’re dangerously under-inflated! The Genius Ideas Mini Air Compressor is a portable and convenient way to make sure that you can inflate your tyres when you need it most. It comes with two differently sized adaptors for different inflation valves. Measuring a compact 17 cm (7 inches) across, it can be easily stored in your boot or glove compartment for emergencies. The durable and fun tyre-shaped design contains a hose and a power adaptor that plugs into the cigarette lighter of your vehicle. If you know someone who’s just passed their test you probably worry about whether they’ll keep up with their car maintenance; this makes a perfect gift for the new driver in your life. It’s not just for cars! You can use the air compressor to inflate bicycle tyres much more quickly than you could with a manual pump. It’s also great for sports equipment and inflatable toys, saving you from puffing away for ages every time someone wants to get the beach ball out!